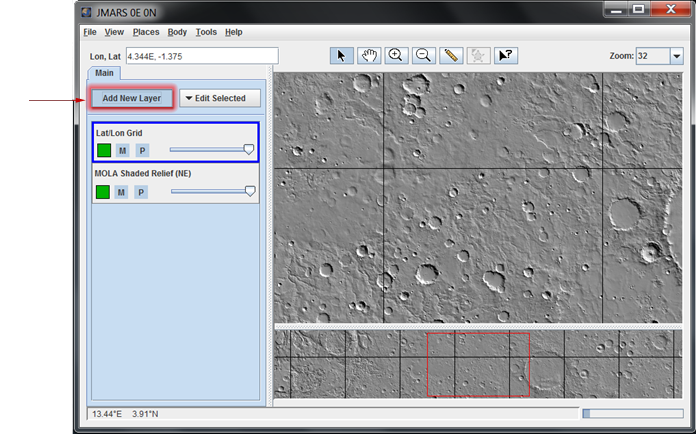 The THEMIS Stamp Layer will display outlines (or "stamps") for all VIS and IR observations acquired by the Thermal Emission Imaging System (THEMIS) camera onboard Mars Odyssey. Since the THEMIS dataset is so large, there are numerous search parameters that allow users to retrieve stamps for only the observations they are interested in viewing. Open the Stamp Layer: In the Layer Manager chose "Add New Layer" -> "Stamps" -> "THEMIS Stamps". Enter Search Parameters: It is not necessary to enter values for all parameters, but the more specific your search the faster it will be. The allowable values for each field are given in the quick reference table below. If you click "Set Lon/Lat to bounds of View" then all of the stamps that are available in the Mainview will be added. Once the stamps are added, there are different image types. Below is an example of the available types of images. The type of the image i.e. Visible (VIS) or Infrared (IR). This is the longitudeof the image's center. All values are based on the IAU 2000 aerocentric model of Mars with east positive longitude. This is the latitude of the image's center. All values are based on the IAU 2000 aerocentric model of Mars with north positive latitude. This is the local time on Mars at the center of the image relative to a division of the Martian day into 24 equal parts. A martian day is slightly longer than 24 hours and 37 minutes, so these times are in "Mars hours, Mars minutes and Mars seconds". Mars Odyssey orbit during which the observation was acquired. By definition, numbered orbits begin at the descending equator crossing of the spacecraft's polar orbit. Based on the average surface temperature (in degrees Kelvin) derived from band 9 of an IR observation. Calculated for the center of each image, this is the angle between the Sun and a line drawn normal to the surface of the planet at the time the image was acquired. An angle of 0 degrees means the Sun is directly overhead and an angle of 90 degrees means the Sun is on the horizon. Daytime infrared images typically have incidence angles between approximately 0-90 degrees and nighttime infrared images typically have incidence angles greater than 90 degrees. The clockwise angle from an imaginary three o’clock line on the image to the north polar axis where the origin of both lines is at the center of a pixel at the center of the image. The number of Earth days since the observation was acquired. This query will only return images that have been acquired AND downlinked. Since downlink data volumes can vary considerably, it may take a few days for very recent images to be downlinked and made available through JMARS. The ABR is derived from band 3 of a VIS-RDR QUBE (or first available band of the highest calibration product available). This file is a PDS IMAGE object with an attached PDS label. The BTR is derived from band 9 of a IR-RDR QUBE (or first available band of the highest calibration product available). 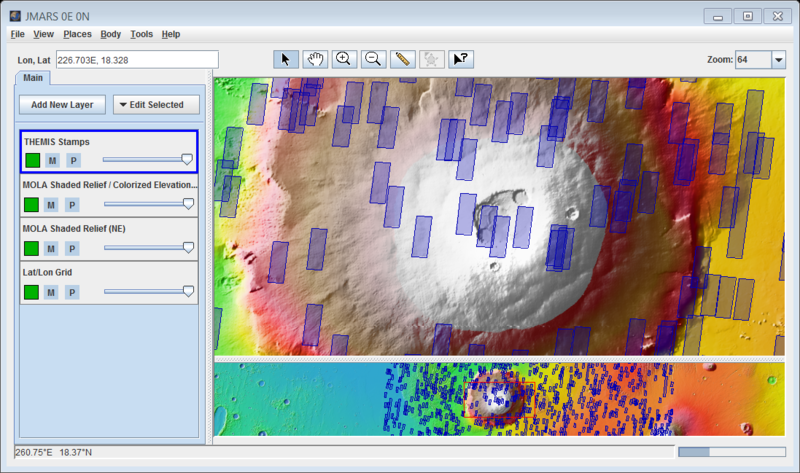 See sdpsis.pdf for a summary of the image processing. This file is a PDS IMAGE object with an attached PDS label. The Browse Image is a simple PNG image product, which is similar to a standard PDS browse image. The DCS is a four-panel browse image composed of the following side-by-side, rectified images: BTR, D964, D875 and D642. The D964 is a decorrelation stretch image using THEMIS IR bands 9,6,4 as the RGB values, respectively. The D964 is a decorrelation stretch image using THEMIS IR bands 8,7,5 as the RGB values, respectively. The D964 is a decorrelation stretch image using THEMIS IR bands 6,4,2 as the RGB values, respectively. This file contains the raw THEMIS science data at the full resolution returned from the spacecraft, time ordered, with duplicates and transmission errors removed. This file is a PDS SPECTRAL_QUBE object with an attached PDS label. 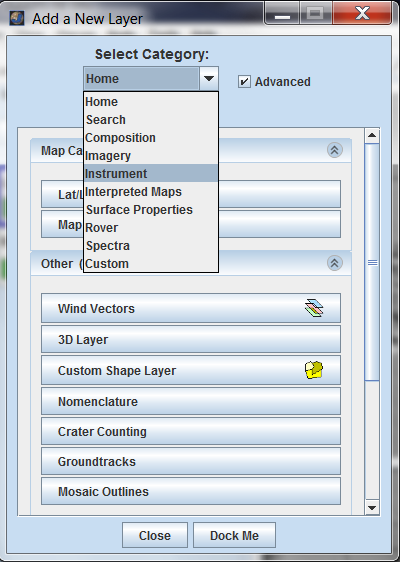 This file contains the geometric projection of the RDR standard data product; the data is stored as a multispectral ISIS CUBE file and associated with a PDS-style, detached label. Note that additional manipulation of the source data may invalidate the calibrated radiance values. The PBT is the projected equivalent of the BTR, which is derived from band 9 of a IR-RDR QUBE (or first available band of the highest calibration product available). See BTR entry above for more information. 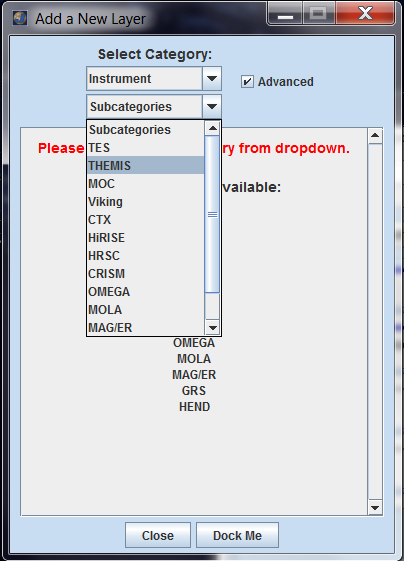 This file contains the radiometrically calibrated version of the THEMIS EDR standard data products. This file is a PDS SPECTRAL_QUBE object with an attached PDS label. The size of a pixel on the surface. For example, THEMIS high-resolution VIS images are 18m/pixel and THEMIS high-resolution IR images are 100m/pixel. The length of time (in seconds) requried to collect all frames of all bands in the downlinked image; typical values range from 0.5 to 450. Band numbers correspond to each layer contained in an image; up to 10 bands available in an IR image and up to 5 bands available in a VIS image. Spatial average of NxN pixels of data before downlink; summing=1 implies that no spatial averaging has been applied. VIS images have summing modes of 1, 2, 4,8,16 and 32; IR images have summing modes of 1-320. THEMIS nominally points nadir, but is occasionally rolled about the velocity vector for various reasons. For periods where the High-Gain Antenna has difficulty pointing at the Earth, Odyssey is sometimes flown in a rolled configuration for long periods of time. THEMIS nominally points nadir, but is occasionally yawed relative to the velocity vector for various reasons. For periods where the High-Gain Antenna has difficulty pointing to the Earth, Odyssey is sometimes flown in a yawed configuration for long periods of time. Although THEMIS is nominally pointed nadir, there are periods where THEMIS is pointed off-nadir for varying lengths of time. NADIR: THEMIS is pointed perpendicular to the surface, which is the nominal pointing mode. OFF-NADIR: THEMIS is pointed off-nadir, but for a limited period of time, usually covering only a few images. HGA_MITIGATION_R-10: THEMIS was rolled -10deg off-nadir for multiple months in 2009 in order to mitigate communications probems with the High Gain Antenna caused by planetary positions and the antenna gimble's range. HGA_MITIGATION_R-20: THEMIS was rolled -20deg off-nadir for multiple months in 2009 in order to mitigate communications probems with the High Gain Antenna caused by planetary positions and the antenna gimble's range. Blank: All THEMIS pointing modes. Description of the image target assigned by the mission planner. When searching by description, all text entered into the field will be directly compared with available descriptions. The Mars year during which observations were collected. Following the convention established in Clancy [JGR April 2000, 1999JE001089], the first Themis mapping images were collected during Mars year 25. The average elevation value at the center of the image; values are derived from a 2 pixel per degree MOLA elevation map. Average derived water ice opacity (11µm) for a warm, daytime IR image; typical values range from 0.0 to 0.15. Average derived dust opacity (9µm) for a warm, daytime IR image; typical values range from 0.05 to 0.25. 20 - 2000As calculated by the Kieffer model. The range of maximum values for the average thermal inertia for each cold, nighttime IR image, derived using Keiffer's KRC thermal model. Model allows for thermal inertia values between 20 and 2000. The range of minimum values for the average thermal inertia for each cold, nighttime IR image, derived using Keiffer's KRC thermal model. Model allows for thermal inertia values between 20 and 2000. 0 - 100Percentage of lines missing from the observation. Percent of total lines missing from the image; values range from 0 to 100, where 100 indicates complete data loss. 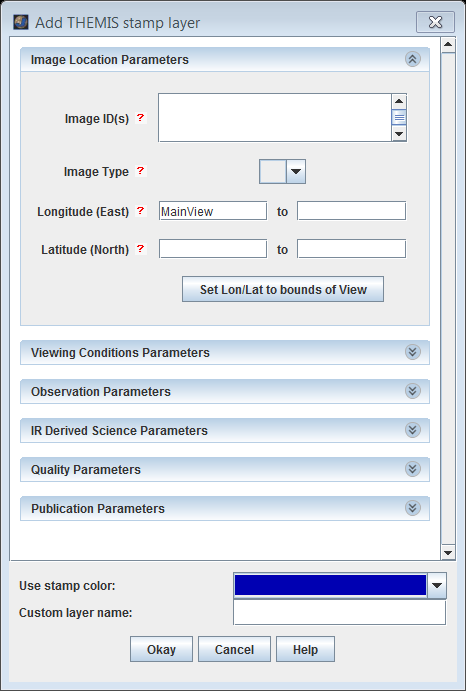 Subjective assessment of image quality ranging from unusable to good; assesment includes consideration of exposure, missing lines, instrument noise, and atmospheric features. This flag indicates that problems may have been encountered during the IR calibration routine and the user is advised to review the quality of the calibration. The flag is triggered by image saturation or under-saturation, length of time between the image and the shutter image, noise evaluation of the shutter image, and yaw angle of the Odyssey spacecraft. Four digit, zero-padded identification number of the original PDS public release of the image. Creation time of the ISIS QUBE on the ground (in UTC), or the last official modification of the ISIS QUBE.